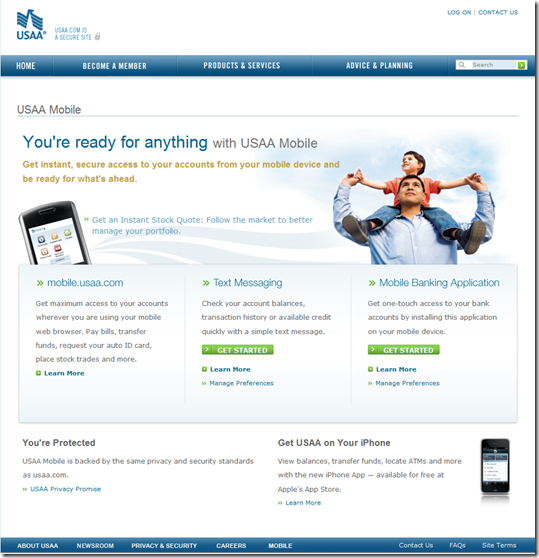 Is USAA the second largest in mobile banking? Last week, USAA released astounding figures on its mobile banking usage: The 10-month-old service is already used by 11.4% — about 800,000 — of its 7 million members, making USAA one of the largest mobile banking providers in the country (press release; see note 1). The mobile platform has bagged more than 13 million logins in ten months, about 3% of its nearly 500 million annual customer contacts (note 2). Only Bank of America, with 2.6 million mobile users, has publicly revealed a larger mobile base. That makes USAA number two among known user bases. However, it is highly likely that both Chase/WaMu and Wells Fargo/Wachovia have cracked the one-million-user mark and are second and third largest. 1. On a side note, USAA posts its press releases in blog format which allows visitors to comment and/or subscribe via RSS. 2. The 3% is approximated from data in the press release: 470 million customer contacts in 2008 and 13 million mobile logins since the service was launched in summer 2008. 3. 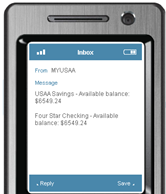 Since last fall, USAA users could access their accounts via Firethorn’s multi-bank iPhone app. If you haven’t been following Twitter the last few months, you may not realize it now has almost eight million monthly unique visitors according to Compete. That’s almost double the traffic it had just two months ago and a nearly a nine-fold gain from a year ago. To put that traffic in perspective, it’s more than half that of the NY Times and slightly more than banking giant Wachovia (see Compete chart below). Financial institutions are pretty new to the micro-blogging platform. In a search today, we found 15 U.S. banks and 22 credit unions with active Twitter feeds (see notes 1, 6-8). There were also and nine international banks for a total of 46. See the table below for the non-inclusive list ranked by number of Twitter users that follow the bank’s feed (note 2). 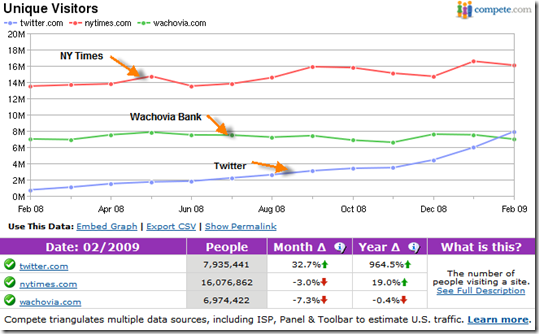 Wachovia (now owned by Wells Fargo), the only major bank that has promoted Twitter on its main website, leads with 2,000 followers (see previous post on Wachovia’s foray on to Twitter). Participating in Twitter is a low-cost entry into social media that can actually help save a customer relationship or three. Compared to blogging, it is much less labor intensive. It’s also less of a marketing platform given the 140-character limit in posts. But in the current environment, perhaps less truly is more. By all means, find a gung-ho Facebook devotee in your bank and let him or her get you into the Tweeting game. 1. To be considered active, the bank or credit union had to have set up a Twitter account, customized it with its logo, have made more than 1 update or “Tweet,” and have at least 10 followers. 2. This is not a complete list. With a few exceptions, we only looked for financial institutions with “bank” or “credit union” in their name. 3. Wells Fargo’s Twitter page says it will be launching soon. 7. Searched on “CU” and found eight more credit unions on 17 March 2009. Thanks Gabriel Garcia. We’ve regularly cited third-party estimates of website traffic to Mint and other PFMs. More often that not, we’ll get a comment or email taking us to task for using such inexact and/or irrelevant data. But we believe that website traffic, even a rough approximation, is a leading indicator of success. Luckily, we now have better metrics for the two online leaders. In response to what appears to be a truth-in-advertising query from Intuit’s general counsel (see note 1), Mint disclosed its registered-user count (note 2), which has been growing at an average of 17% per month in Q4 2008 and so far in this year. As of yesterday, Mint had 934,000 users, double third quarter’s end-count. That’s 3,400 new registered users per day (seven days a week), almost 25,000 per week. The company should pass one million before St. Patrick’s day. While this growth in registered users is impressive, what’s truly astonishing is that 70% of the registered users, 680,000 so far, have entered at least one bank or credit card username/password in order to automatically download transactions into Mint. In response to Mint’s disclosure, Quicken Online reported its 650,000 registered users, currently growing at a 45,000-per-week clip. If that continues, they’ll pass one million before the April tax deadline. It looks like there’s quite a battle shaping up between the two leading online personal finance specialists. And don’t overlook the banks. Both Bank of America (2.5 mil as of April 2008) and Wells Fargo (1 mil as of Nov 2008) have more online personal finance users at this point. What it means: Account aggregation, left for dead a few years ago, is making a fearsome comeback. The three biggest players, Bank of America, Mint, and Quicken Online, now have more than 4 million registered users, approximately 4% of all U.S. banking households (note 3). 1. Intuit’s letter to Mint here. 3. Yodlee provides the aggregation engine for both Bank of America and Mint. Bank of America has been making the rounds with the press touting the runaway success of its mobile banking solutions. Major stories ran in American Banker and The Wall Street Journal this week. The bank, with 29 million online banking users, reports numbers just shy of the 2-million mark in mobile. That’s up from one million early this summer (post here). While it’s still less than 10% of online banking customers, it’s an impressive number considering fewer than 4 million mobile banking households exist in the entire country (see note 1). use an iPhone or iPod touch. 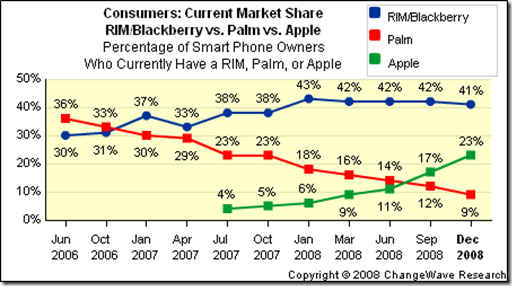 That’s about double the usage you’d expect given Apple’s 23% share of the U.S. installed smart phone base (note 2, 3). The bank believes the mobile channel is driving some new business to the bank with 8% to 10% of mobile bankers, almost 200,000, having signed up for the service within 90 days of opening a BofA account (note 4). 1. 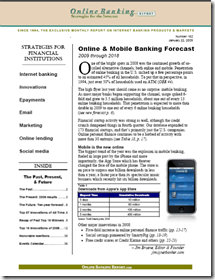 See our latest Online Banking Report: Online & Mobile Forecast for more details. 2. The 23% figure does not include iPod Touch. 3. One other bank provided its usage numbers to the WSJ: Mississippi’s BankPlus reported 4,000 users with 60% of the usage (2,400) coming from iPhone users. 4. That number doesn’t seem all that surprising. You’d expect new customers would be somewhat more likely to sign up for new delivery channels than the existing base. And given typical banking churn, 10% to 20% of a bank’s customer base are new every year. The latest Online Banking Report: 2009 to 2018 Online & Mobile Banking Forecast is now available. It was mailed yesterday to subscribers. It’s also available online here. There’s no charge for current subscribers; others may access it immediately for US$495. The report includes our latest 10-year online banking and bill pay forecast. This year we again bumped our long-term usage forecast to 6%, up from 3%, to reflect a more robust outlook for adoption, primarily from mobile-only users. For example, we are now projecting 71 million U.S. households banking and/or paying bills online by 2013 compared to last year’s forecast predicting 66 million for the same period. Mobile banking (see note 1) access is included in the overall online banking numbers, but it’s also shown as a separate line item. Based on the new open-platform standards ushered in by the iPhone and App Store, we increased both our short- and long-term adoption forecast by 10% to 20%. 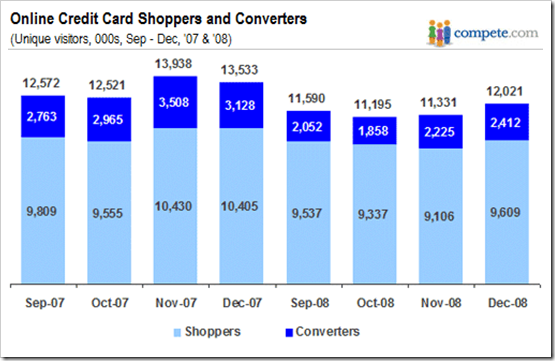 For example, by year-end 2011 we now predict there will be 18 million U.S. mobile banking households. A year ago we forecasted 16 million. We also included a revised forecast for U.S. peer-to-peer lending. We cut back our short-term estimates by more than 50% due to regulatory and economic constraints on the business. A full 10-year forecast is included in the report. The report also includes a summary of the top ten innovations of the past year including the surge in mobile banking demand and the marked increase in traffic to personal finance speciality sites such as Mint and SmartyPig. 1. A mobile banking household is one where someone has used a mobile device to access bank or credit card account info within the past six months. Includes text-based queries, but not simple broadcast alerts. It’s so refreshing to have some real numbers to go on, even if they are self reported. Aside from Prosper, Lending Club (here), and most recently SmartyPig (here), few of the startups we track provide meaningful metrics on their operations. 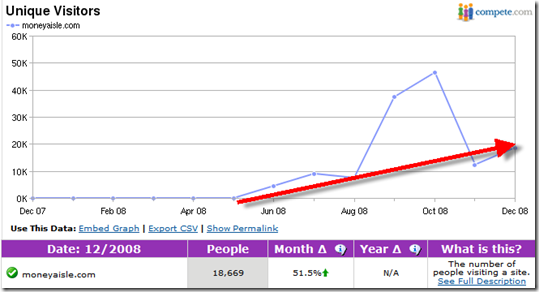 That’s why we use Compete website traffic estimates as a proxy for success. And for those of you who still want traffic numbers, MoneyAisle’s website usage (monthly unique visitors) has been trending upwards after suffering a post-launch dip in November. In December, visitors totaled just under 20,000. Bottom line: It’s a promising start for the company which earned an OBR Best of the Web this summer, was picked by the audience as Best of Show in October’s Finovate (video here), and was recently chosen as a top-10 innovation of the year in our most recent Online Banking Report (here). When MoneyAisle adds integrated online account opening (powered by Andera), results should be even stronger. 1. Deposit-generated total is 6% of total auctions run, because consumers are not obligated to make the deposit after they run the auction. 2. My speculative estimates, not provided from the company. 3. We outlined the company in a June blog post and in the pages of our Online Banking Report on New Models for Lead Generation and Online Banking Report on Growing Deposits in the Digital Age. Engaging users doesn’t have to to be a long and drawn-out process with multiple passes through legal and compliance to ensure you won’t end up on the 10-most-wanted list at the OCC. All you have to do is ask customers a question now and then to show that you are genuinely listening. And with low-cost web-based surveys, the cost to conduct a short survey among your own customers is minimal. What should we write about in our next newsletter/blog/website? Which offer should we put on our homepage? How would you rate your recent experience with our call center? 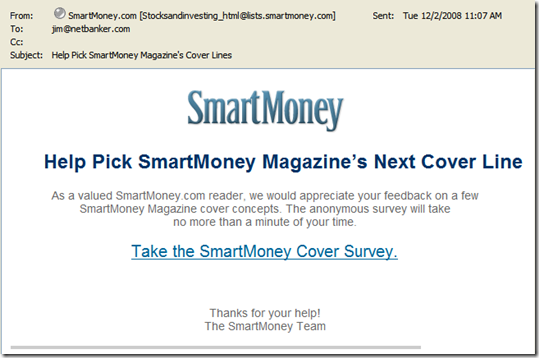 In a real-world example today, SmartMoney Magazine sent me an email (see below) requesting that I complete its “cover survey” which would take “no more than a minute.” The Survey Monkey-powered survey was indeed just 3 questions and took only seconds to complete. There was no marketing (see note 1), no cross sales, and I was left with a better impression of the magazine. Besides a satisfied customer, SmartMoney gains valuable editorial feedback. 1. After completing the survey I was dropped on to the SmartMoney homepage increasing its pageviews and unique visitor totals for December. 2. Photo credit (via flickr): Ryan McFarland at www.zieak.com. 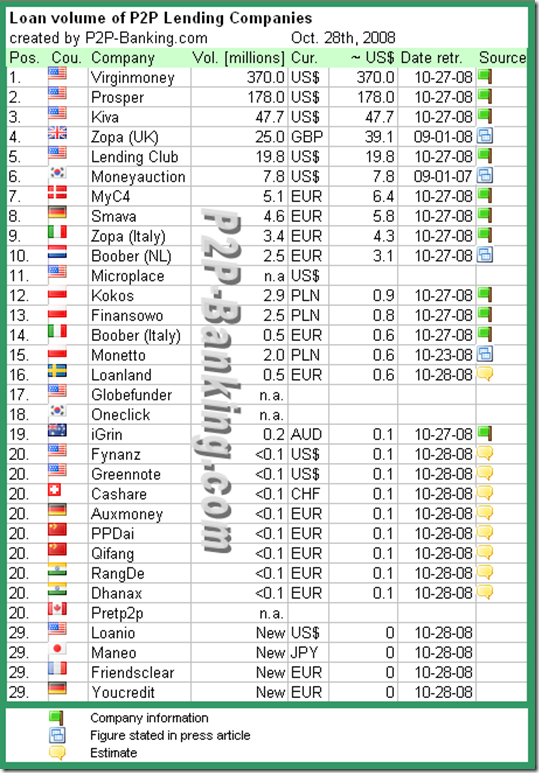 Industry blog, P2P-banking.com recently compiled a list of peer-to-peer loan volumes from around the world. The chart is reprinted by permission below. These numbers are cumulative, all-time volumes since inception. More than half is from Virgin Money USA which has helped individuals put $370 million in loans together since it began as Circle Lending in 2001. Facilitators: My definition of peer-to-peer lending excludes Virgin Money and Loanback because they do not serve as matchmakers (note 1). They do play a crucial role in putting a legal framework in place for friends-and-family loans and often end up servicing the loans as well. They are more like PayPal where Prosper/Lending Club are like eBay. Microfinance markets: I would exclude Kiva as well. It's an awesome platform that allows U.S. citizens to loan money to third-world merchants at zero interest. A powerful tool for philanthropy, yes, but not really peer-to-peer. The same goes for MyC4 and Microplace. So excluding the above companies, total worldwide originations are $262 million, with two-thirds of that from Prosper. 1. This does not mean I dislike Virgin Money's business model, just that its loan volume is not comparable to the others on the list. As I was drilling into the latest Compete traffic numbers for the annual Online Banking Report planning issue, I noticed a significant uptick in traffic to online personal finance specialists, almost across the board. Sept. traffic revealed a total of 1.2 million unique visitors (note 1) compared to less than 400,000 a year ago. Not surprisingly, consumers appear to be taking a closer look at their finances. PNC Virtual Wallet launched in July (coverage here) by PNC Bank, which trailed only Mint last month with nearly 140,000 unique visitors (see 2 below). Rudder (a relaunch of Spendview) drew 50,000 visitors last month after its launch at DEMOfall in early Sept.
Granted, the PNC Virtual Wallet benefits enormously from the 2 million monthly visitors to parent PNC.com and PNCBank.com. Yet, it’s still an impressive total and is encouraging for banks and credit unions considering similar efforts. 1. Sum of the monthly unique visitors from all PFM companies, visitors that went to more than one PFM provider are not eliminated from the total, so there is double counting in the totals. Data source is Compete, pulled 21 Oct 2008. 2. Rudder was previously Spendview, but we consider them to be essentially a new company.